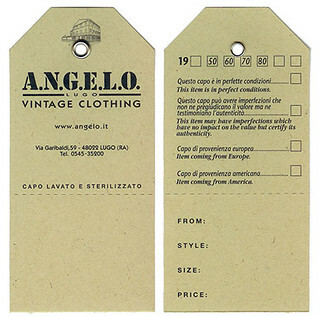 All our vintage clothes and accessories are labelled with a specific tag indicating their product line. We think it's essential to provide our customers with the finest selection of items and inform them about the story behind each garment or accessory. Vintage shopping is an experience: it's the exciting pleasure of indulging in selecting something unique and exclusive for yourself. And each and every item always has a story to tell. 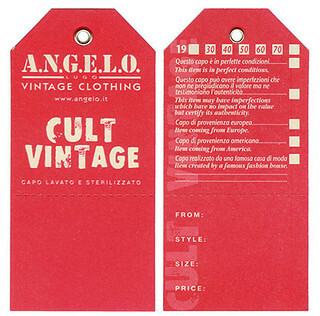 This tag identifies recent items (1950s - 1990s), denimwear, military clothes and activewear made in Italy, Europe and in the United States. This selection is made with an eye to current trends and is available at accessible prices. 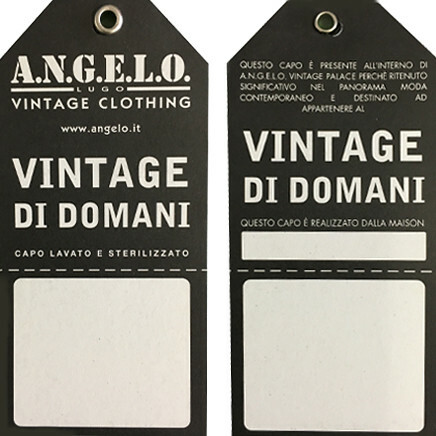 This tag identifies the finest luxury vintage items, designed by exclusive brands or tailors and made of exquisite materials. This selection includes iconic and unique items representing the most flourishing periods of the history of fashion, mainly from the 1930s to the 1970s. The "Vintage of Tomorrow" tag identifies second-hand clothes and accessories from contemporary collections - generally from the last decade - that we think will become relevant to vintage research in the future. 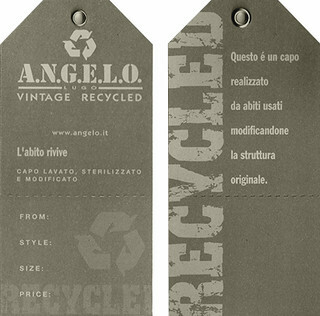 This tag identifies second-hand and pre-loved items from important brands which were re-designed for modern times, enhancing their qualities and adding value to their flaws. Angelo Caroli, founder of A.N.G.E.L.O., worked in synergy with Stefania Bertoni, expert and teacher of fashion recycling and winner of several awards in fashion jewelry, to create A.N.G.E.L.O. Recycled items. The aim of the project is giving a second life to the fashion from the past, recovering materials that would otherwise be thrown away. Re-designing and re-thinking are key to transform a garment from its original shape and translate it into a contemporary language where it can be appreciated again. Find out where you can buy A.N.G.E.L.O.